As we moved into our new 3 bedroom home, we knew that we'd sleep in one bedroom, the second would be for all of you who come to visit (please do! ), but it wasn't really obvious what to do with the third bedroom. I was eyeing it for an office, but Crystal warned me that we might have a different need for it. And, as usual, she was right... I guess we'll be needing a nursery! Yup, it's a good thing that we're all registered with the NHS, because it looks like we're going to be having a baby! The due date is May 3rd, and everything is going fine so far. (I'll let Crystal pass along any details of nausea that she cares to share.) 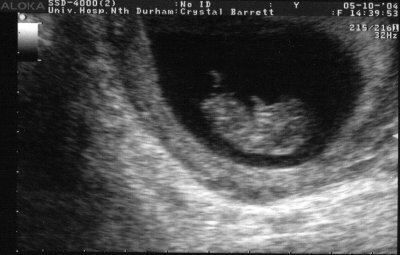 We met with the midwife a couple of weeks ago for a ticky-box appointment, and then went for our first ultrasound scan earlier this week. As many of you know, this is actually our second pregnancy. We tragically lost our first baby with a late miscarriage at 17 weeks. As you can imagine, we're somewhat scared and unsure this time around, especially until we get well past that 17 week milestone (around Thanksgiving). I tried to come up something funny to do with the ultrasound picture this time, but my attempts at putting a bobby hat on his/her little head, or adding a red phone box to Crystal's womb just didn't seem to work. So instead, I offer you this amazing little video clip for your enjoyment. As we enjoy our new beginning of life here in Durham, I hope you will all rejoice with us at this new beginning with which God has blessed us!